Overview: The Massai Point Nature Trail is a short, educational loop hike at Chiricahua National Monument, that explains the area's natural history. Interpretive signs along the trail describe the Chiricahua Mountain's violent volcanic past, subsequent geologic events, and the creation of its unusual rock formations. Other signs enlighten visitors to the Monument's biologic communities and human history. 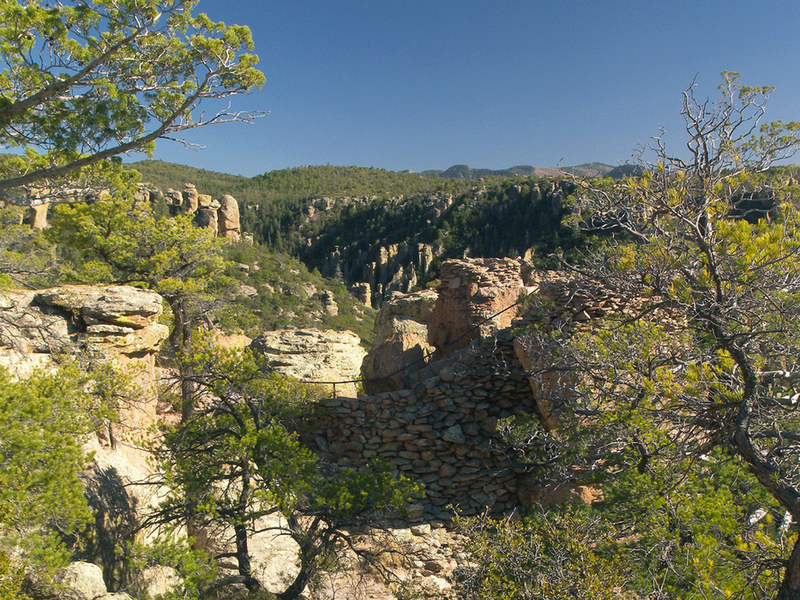 Although this easy hike is not the Monument's star attraction, it answers the "how and why" of Chiricahua National Monument. Hike: Beginning at the north end of the Massai Point parking lot, the Massai Point Nature Trail heads north into the trees. It immediately comes to a signed junction with a short side trail, that heads uphill to an exhibit building at the apex of Massai Point. Follow the trail to the small exhibit building, which affords 360 degree views of southeastern Arizona. Plaques inside the circular structure describe the sky island aspect of the Chiricahua Mountains, and show the outline of the Turkey Creek Caldera. At the rear of the exhibit building, a cement walkway leads down the back side of the hill to the beginning of the Massai Point Nature Trail. Now back at its beginning, follow the Massai Point Nature Trail downhill to the west, away from the parking lot. The trail contours along a hillside, where pinyon and cypress trees frame a wonderful view to the west, overlooking the Monument. Further on, the trail passes the junction with the Ed Riggs Trail, and a short spur trail leading back to the parking lot. The trail now ventures into an area of hoodoos overlooking Rhyolite Canyon. A short side trail climbs to the top of one of the hoodoos, where a viewpoint has been constructed. There are sweeping views to be found at its tiny summit. A large balanced rock rests nearby. Leaving the hoodoos behind, the Massai Point Nature Trail finishes wrapping around Massai Point, before turning north to return to the Massai Point parking area. A sign marks its arrival at the south end of the parking lot. From I-10 exit 340 in Willcox, head south on highway 186 for about 33.2 miles to highway 181. Turn left (east) onto highway 181, and follow it for 3 miles to the Chiricahua National Monument entrance. (see fee above) Follow the road (which later becomes "Scenic Drive") for approximately 7.5 miles beyond the Monument entrance, to its end at the Massai Point parking lot. There are trail signs for "Massai Nature Trail" at the north and south ends of the parking lot.